Val d’Isère, Tignes, La Plagne and Les Arcs have teamed up to show solidarity with ‘Remain’ supporters in the UK. The event will take place on Saturday 06 April in Bourg-Saint-Maurice as the last Eurostar train of the season before the (currently scheduled) Brexit leaves for London. The Bourg St Maurice tourist office will be handing out fresh croissants to all passengers, who will be serenaded by rousing music such as ‘We’ll Meet Again’ by Vera Lynn and the British and French national anthems. 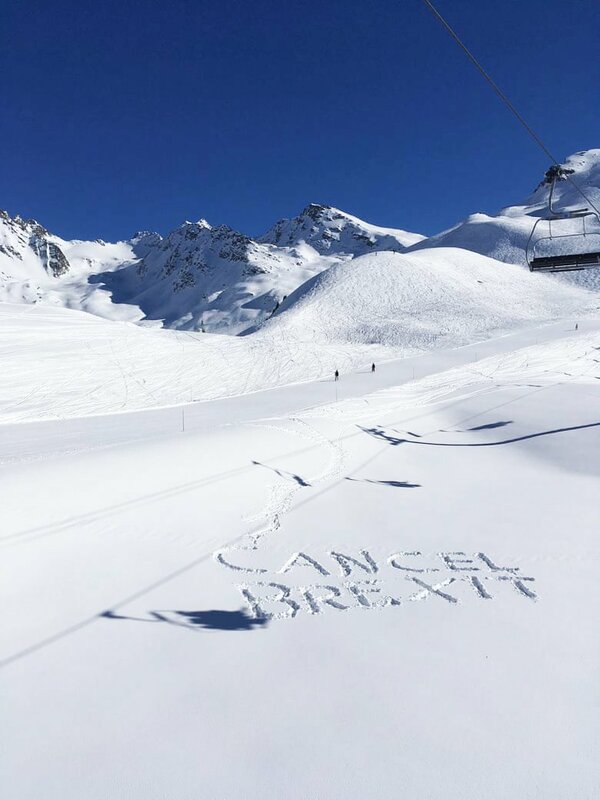 Almost half of the overseas skiers and snowboarders who visit Val d’Isère each winter come from the UK and there is a lot of concern among locals that Brexit will have a significant effect on future bookings. Katie Hall, 24, works at the Ecole du Ski Français (ESF) in Val d’Isère and is making her own protest by swimming the length of the English Channel (35km) in the local Aquasportif Center. Hall – from Southampton – will swim 200 lengths per day. Les Arcs have been very pro-UK for several years and have hosted ‘The Great British Celebration‘ for the last three winters. Brexit isn’t stopping skiers heading about to France for some spring skiing in the sunshine. There are some great deals available for early-April and Easter. Click here for the latest offers or contact the Chaletline team on 01822 617761 for more details. This entry was posted in Chalets, La Plagne, Les Arcs, Tignes, Val d'Isere and tagged brexit, tignes, val d'isere. Bookmark the permalink. Welcome to the Chaletline Blog! Keep dropping in to find out about the latest news and deals from Chaletline.co.uk - the UK's specialists in catered ski chalets.